People requested a comprehensive comparison guide between Oral B 3000 and 5000, and we delivered. 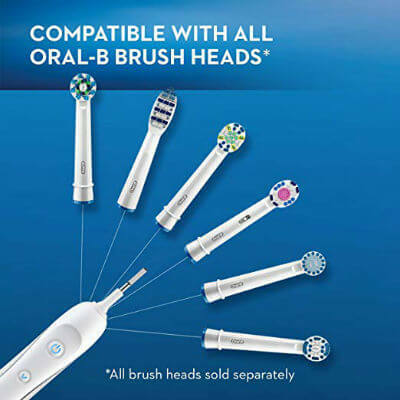 This guide offers objectively collected information regarding the specs, features, and performance of the two Oral-B electric toothbrushes. If you are still on the fence after reading this comparison, check out our best electric toothbrush article. This product only comes in one color: white. The round-head design of the product was dentist-inspired which makes it give off that professional-vibe each time it is used. 1 charging stand and premium charger with 1 brush head storage that can hold up to four head refills. 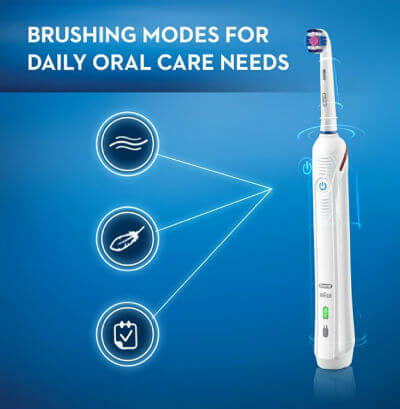 The Pro 3000 contains 3 modes (Daily Clean, Gum Care and Sensitive), a Pressure Sensor that lights up in case the user brushes too hard and an in-handle timer to help the user brush the dentist-recommended time: 2 minutes. These features make it really convenient for its users. Much like the Pro 3000, Oral-B Pro 5000, also comes in the most sophisticated color in the color wheel: white. The color option of this product is universal, making it convenient enough to fit in any bathroom décor. One charging stand and premium charger with refill head storage. Brush head storage compartment (Holds up to four brush heads). Unlike the Pro 3000, this product contains 5 modes (Daily Clean, Gum Care, Sensitive, Whitening, Deep-Clean). The Pro 5000 also has a visible pressure sensor much like the previous product, and an in-handle timer that pulses every 30 seconds to let the user know when to switch areas of the mouth. The Pro 3000 comes with one Pro White Brush Head, while the 5000 comes with one floss action and one cross action brush head. Some might want the Electric toothbrush because of the brush head it provides, but, be aware that brush heads can be bought separately. Whichever product the user prefers, it depends on the user’s own preferences. The Pro 5000 has a basic travel case, unlike the Pro 3000 that doesn’t come with one at all. Some might find this predicament quite inconvenient. If the user often travels, they will find the Pro 5000 more convenient than the 3000; since it comes with a travel case that they may bring to places they may go to. But, if the 3000 is suitable for the user’s taste, they can buy a separate travel case or pouch they may put the handle I, just to keep the item safe. The Pro 5000 contains 5 modes (Daily Clean, Gum Care, Sensitive, Whitening, Deep-Clean), whilst the Pro 3000 contains 3 modes (Daily Clean, Gum Care and Sensitive), which gives the Pro 5000 advantage in terms of modes to choose from. Some people might be peculiar about this particular feature, some may not. It all depends on the user’s preferences. Although mode-wise, the 5000 has the upper hand, the 3000 might just be convenient for some. At Dental Dorks, we are not particularly picky when it comes to brushing modes. In fact, we often consider brushing modes such as the infamous “whitening” mode to be rather useless and just an extra form of markering. The Pro 3000 is generally less expensive than the Pro 5000. For some, the price does not really matter, “Quality first, price next” they say. Although this saying is true, in this case, both electric toothbrushes have a high quality, so it’s just up to the user to choose which brush he thinks is convenient. The Pro 3000 does not come with a travel case, on the other hand, the Pro 5000-travel case has a thin, inexpensive plastic material design, made to resist impacts and prevent accidental brush activation. When it comes to the design of the handle, the Pro 3000 contains a Visible Pressure Sensor, unlike the 5000 that does not have one, rather only a plain pressure sensor. Some users might prefer the 3000 because of this feature. Others, however, might not be that concerned about detail and design, rather just looking for nice features that will make the usage of the product convenient for them. The Oral-B 3000 and the Pro 5000 both contain rechargeable NIMH batteries. These batteries require minimal replacement expenses and do not shortly run out of power. Having a brush run out of power in the middle of a brushing session may be a very awkward situation to be seeing yourself in. But, with the help of the Oral-B App that allows you to view the power levels of the brush; you may be able to prevent the occurrence of such awkward predicaments. There is a huge similarity in the cleaning performance of both, Oral-B 5000 and 3000. It is attributed to the fact that these models share a common motor and offer equal power levels (due to the same kind of battery they have), pulsations and oscillations on every cleaning mode they both contain. Any of the cleaning modes that both brushes have are convenient and the user can use the brushes in whichever way they please. Honestly, these two models are very similar to each other in almost all aspects. It is my honest opinion that you should get whichever one is priced lower.